Rich Merriman stands besides 5' painting of Sgt. Peppers. 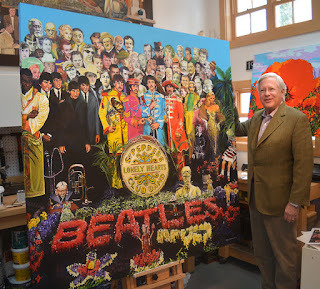 His portrait is included in the NEW work by George Rothacker. The idea developed from a lunch meeting between Rich and George in a discussion about the Rock Legends series to portraits the artist was in the process of painting. 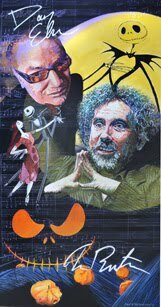 Paintings included stars such as John Lennon, Janis Joplin, Freddie Mercury and Bruce Springsteen as well as 7 other icons of the genre. 60 portraits that comprised the background of the cover. 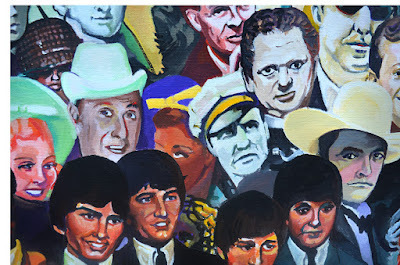 It featured writers Dylan Thomas, George Bernard Shaw and William Burroughs, artists, illustrators and illustrations like one of a a Vargas girl, actors such as Tony Curtis and W.C. Fields, and comedians Laurel and Hardy and Lenny Bruce, as well a wax figures of boxer Sonny Liston and the blonde bombshell, Diana Dors …each of whom was gleaned from a list personally compiled by Paul, George, John and Ringo. Tom Mix, wax figures of the Fabulous Four and others. 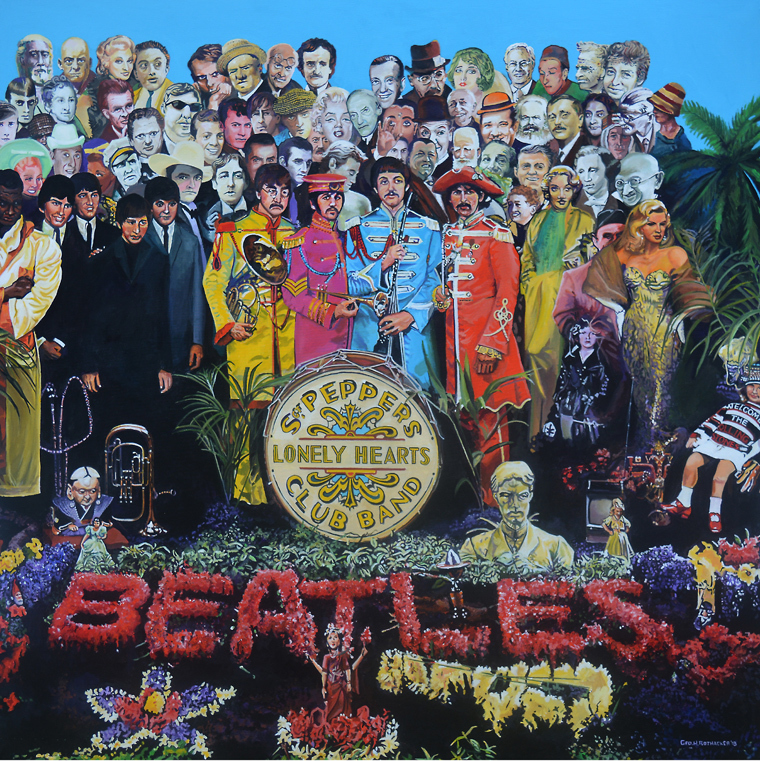 Before beginning the painting, George researched each portrait and found a similar or more complete photo or piece of artwork of each person, con verging it into a style that would allow all of the portraits and those from the album to work together as a unit and still maintain the integrity of the original cover. The painting will be on tour and can be viewed at Pennsylvania Trust (by appointment) until May 1, 2018. 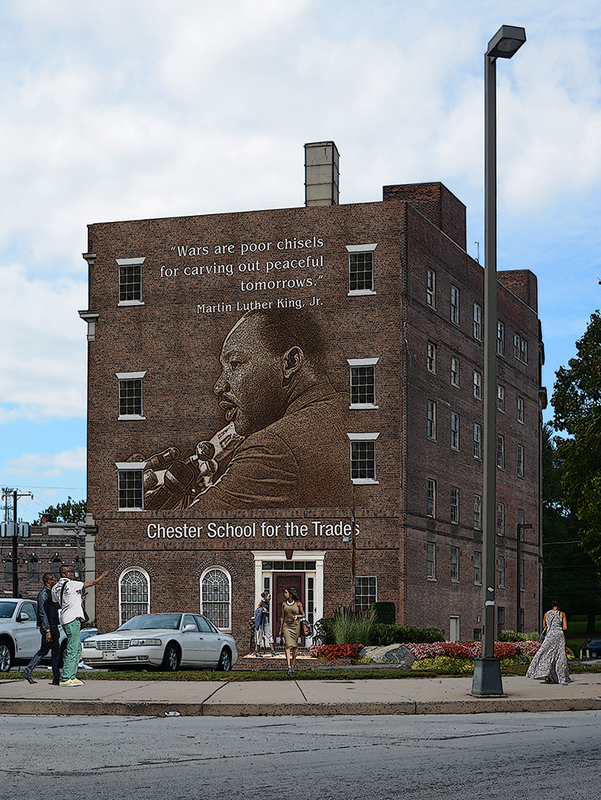 The Chester Charter School for the Arts, a public non-profit charter school in Chester, Pennsylvania District, combines the fine arts with traditional classroom subjects in ways designed to foster confidence and purpose and to significantly deepen academic engagement. I was directed to the school by Bruce Brown, the Senior Philanthropy Consultant at Pennsylvania Trust Company, a wealth management firm in Radnor, Pa. He gave me his recommendation based on the question I posed, "What is the most valuable and under funded non-profit in Delaware County?" After some discussion with Bruce, I put in a call to the School and spoke to the director about our desire, and one to which we would devote time, talent and resources in a purposeful and significant way. At the conclusion of the call, I was invited to visit the existing school facility, and also get a tour of the NEW school building to be opened at the end of August, 2017. At our meeting we discussed how my friend and I might be of help, and how we might contribute. A section of Highland Gardens as it is today. After deciding on the "concept", we dedicated time to developing a plan, a time frame, and elements necessary to create a successful event. I began my process by photographing deteriorating areas of Chester and refurbishing them, not in b rick and mortar reality, but using photoshop retouching skills. My vision was a display of large panels depicting Chester neighborhoods with sections of the business district updated and modernized, symbolically creating a restored Chester City. Where does a City get its tradesmen? First, it has to keep the City's children in school, and have work and decent living conditions in the City for them to stay or return to Chester. To this end, we created a virtual trade school by re-envisoning he old Spencer Stationery/Printing building as a place where students can learn the disciplines and techniques used in the trades. Until the 1980, Spencer Printing and Engraving occupied this building around 1916 between 7th and 8th Streets. This rear view of the building shows it re-imagined as a School for the Trades. A mural of Martin Luther King with an appropriate quote. When starting this endeavor, We didn't actually know 'how" these photo-restorations would be used, or even if, but it was part of our process to learn more about the City and how it would appear if significant financial resources were dedicated to development. The photos on this page depict the street restorations I have created, two of which will appear in a modified form at the event in May 2018. 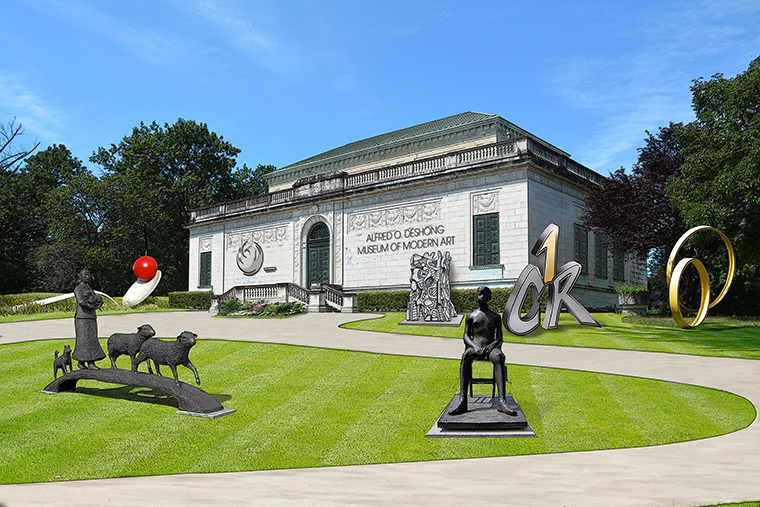 A few of the scenes have been used as a part of the school's educational program, one appeared on the save-the-date card and the web, and two will be displayed beside artwork created by students in large atrium adjacent to the entrance to the School the evening of the event. What is most significant about a “concept” is that it is not necessary for the concept to literally translate an idea, but is used instead to “capture the imagination” of others, and give “content” to an evolving idea. The purpose of the Chester images is to show “what could happen,” not “what will,” but that is often enough for an idea to grow, take shape and become fully realized. 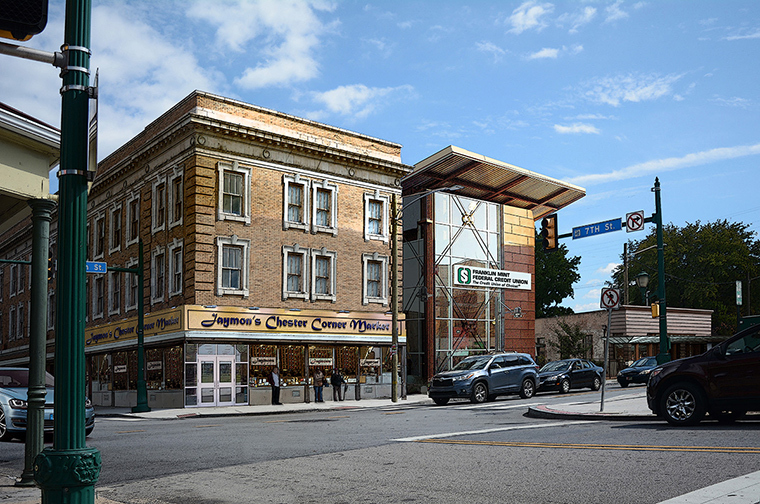 The corner building at 7th Street has had its facade restored and been re-purposed as a market. A new credit union building and restaurant were added to the right. Students of the CCSA were asked what shops or businesses they would like to see in their neighborhood. 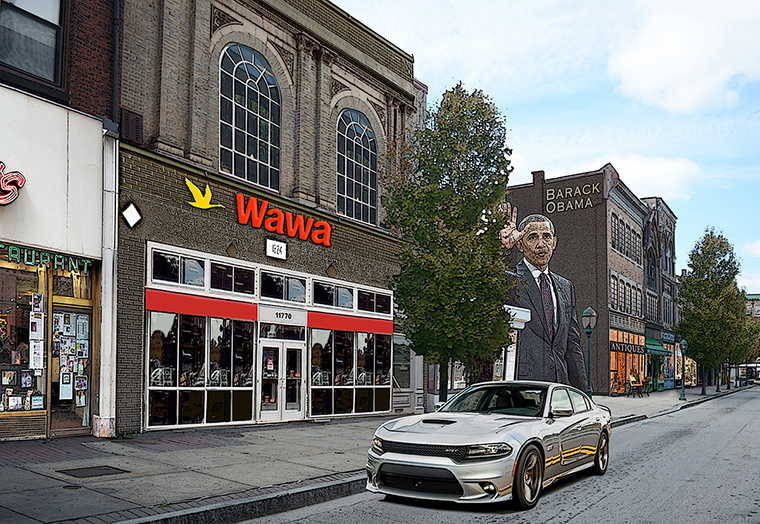 In this restoration, we added a Wawa Food Market, an antiques store and a mural of Barack Obama. In the 1950s or 60s one of the homes in this block near I-95 had a home modern addition built as a store front. 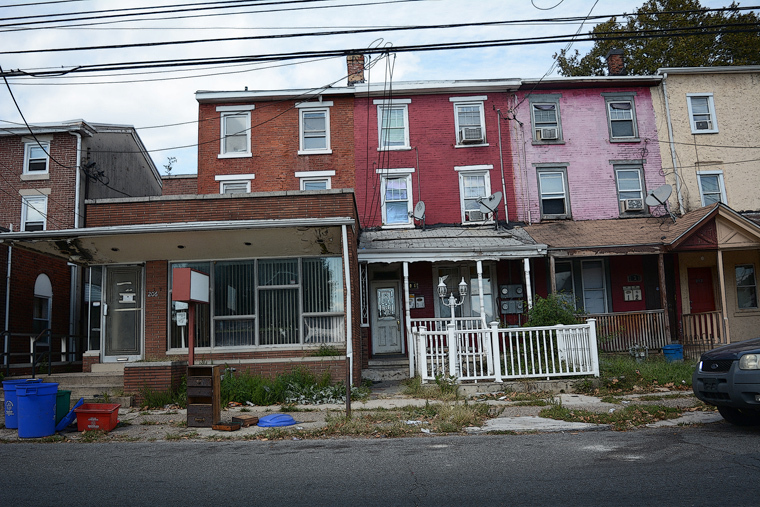 In recent years the storefront deteriorated along with the homes on the block (see photo below). 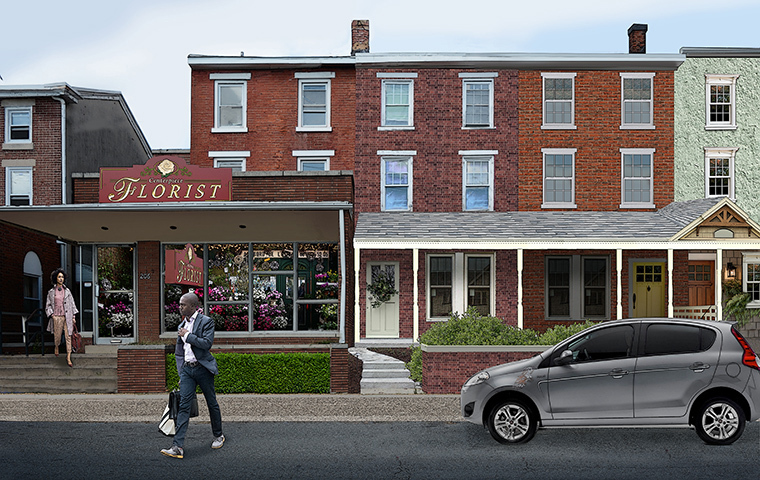 We cleaned up the storefront and turned it into a florist shop, and repaired and refurbished the buildings virtually to re-envision the street as many rows appear in neighboring suburbs of Media, West Chester...and even New Hope.Through neglect, lack of resources and discouragement, many Chester neighborhoods have deteriorated. Our solution is not to tear neighborhoods down, but build them up...street by street, and preserve the character of the City that once was. In the 1950s-1960s, Bergers sold washers and driers and other appliances. We restored the original facade and converted the store to a boutique for women's fashion. The street also houses a café, and art supply shop, and a mural of Chester native, Ethel Waters. Students dove in with their opinions of what the’d like to see in their neighborhood. These included a music store, Starbucks, Pink and Chipotle. One female student asked if a theater we created could be a boxing venue instead. This workout gym and training center adapts well to the existing abandoned building. The Wolfe Building on Route 13 once housed a radio station on its upper floors. The structure is on the National Historic Register and in this restoration is shown surrounded by a business building and a corporate center on lots that are currently unused. Have an idea in need of realization, a plan for a business launch or celebration, or the reinvention of a space, product or your company? RAD is about creating realities from dreams and ideas, and implementing them within your budget. We're not talking of out-of-the-box answers based on some other model. Our concepts are based on your company, your product and your needs.....from concept to reality. If that's what you want...we're the place to start...and we're the place that will complete your project in a unique and special way. We’ve been doing this for customers for 40 years...and we're good at it. Over the years, RAD has created holiday cards blending friends and family into the season. Some are in print, others video, and a couple in "flash" animation that may soon disappear from view due to technological changes.